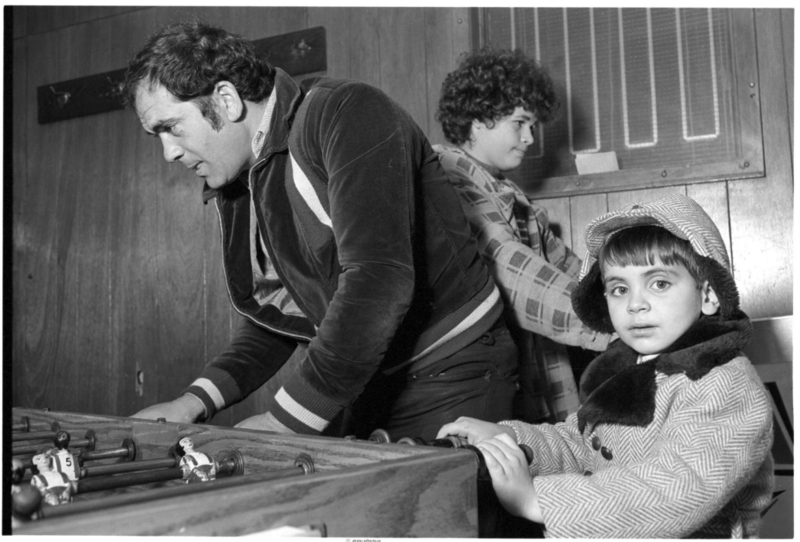 Three generations of Portuguese-Canadians at Tivoli Billiards Hall, on Augusta Ave., Kensington Market, 1980. Photo by Gilberto Prioste. 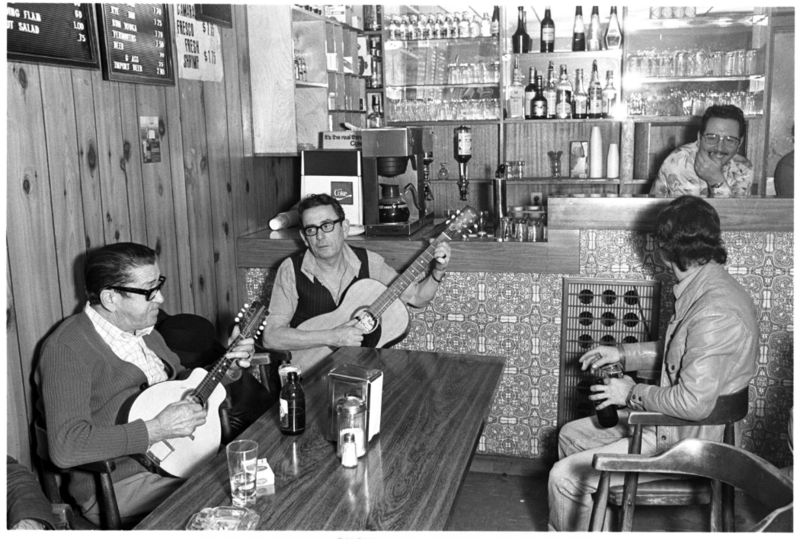 From May 13-19, Toronto’s City Hall will feature “The Portuguese in Toronto,” a free photo exhibit. What follows are some reflections on how historians can engage with the public by one of the exhibit’s organizers. 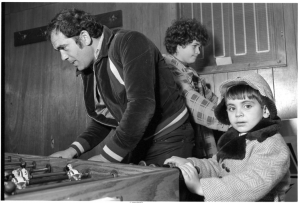 On May 13, 2013, the Portuguese Canadian History Project’s (PCHP) photographic exhibit celebrating the sixtieth anniversary of mass Portuguese migration to Canada will open (the inaugural event is scheduled for 5:30, if you are free). Held in the Rotunda of Toronto’s City Hall, the exhibit will feature twenty historic photographs from the PCHP’s catalogue in the Clara Thomas Archives and Special Collections (CTASC) at York University, along with other images provided by various community members. The enthusiastic and active participation of community organizations and individuals has played a key part in the exhibit. For me, the most refreshing aspect of curating an exhibit like this is seeing just how excited people get about the kind of history – a history, I think, in contrast to the ‘War of 1812-esque’ public history we have seen so much of recently – we want to share. Like most of the PCHP’s initiatives, this one started with an offer for collaboration. In the fall of 2012, Gilberto Fernandes, a fellow PCHP co-director, received a phone call: “please hold for the Consul-General.” Not familiar with consulate etiquette, Gil has admitted that he was a little thrown; indeed, having received a couple calls myself since then, it takes some getting used to. Once the Consul picked up, the PCHP was invited to lunch to discuss a possible project. Meeting in a corner in a downtown Toronto Portuguese restaurant, the Consul explained to us that he wanted to host an event commemorating the sixtieth anniversary of Portuguese mass-migration to Canada (in 1953, an agreement was signed between Portugal and Canada welcoming Portuguese workers). Excitingly, the Consul wanted us to curate the exhibit. He had seen our website and online exhibits that highlighted labour, gender, children, recreation, household economy, and political activism and protest (sometimes against the Portuguese consulate – the photo we used in the Consul’s newsletter in January, for example, shows people protesting the Consulate in the 1960s when it represented Portugal’s dictatorship) and he was open to our approach. Patrons playing guitar at the Blue Wall Cafe on Augusta Ave, Kensington Market, 1980. Photo by Gilberto Prioste. Our hosts began to realize that they did not need to be dignitaries or professional soccer players to be included in a historical narrative. They and their history were empowered. As you will see when you visit the exhibit (free of charge and open to all May 13-19 in Toronto’s City Hall), the photos we chose center on lived experience. Major events are included, of course, but they are not the center of our photos, merely a stage upon which our actors perform. More often than not though, we could not pinpoint exact dates of photos, highlighting the ‘everyday experience’ that they convey. 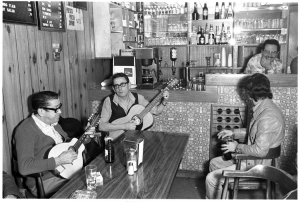 Are the photos inclusive of every aspect of Portuguese Canadian life over that last sixty years? No. However, what has been refreshing and encouraging is that participants in the exhibit have not only learned to acknowledge their role in history, but also have come to own their place in history. Something that, it seems to me, should be the goal of public history. Raphael Costa is a PhD candidate in History at York University and a Co-Director of the Portuguese Canadian History Project with Gilberto Fernandes, Susana Miranda and Emanuel da Silva. His research looks at democratization and local political culture in Portugal since the early 1960s. A great example of participatory research. I would like to hear more of your analysis of the community leaders’ shift in historical thinking that you describe. Thanks, Alexander. Here’s our news feed if you’re interested in more info: http://archives.library.yorku.ca/pchp/. Our contact info is there as well. We’d be happy to talk. Will this exhibit be presented elsewhere? I missed it at City Hall. It will also be at the Dundas West Street festival (http://wp.dundaswestbia.ca/?page_id=107) on June 8 near Dundas and Dovercourt.